Not being a slave to fashion myself (no instinct either! ), I was delighted to come across this great shopping manual, even if it is two years old. Great style, and sense, never go out of fashion. 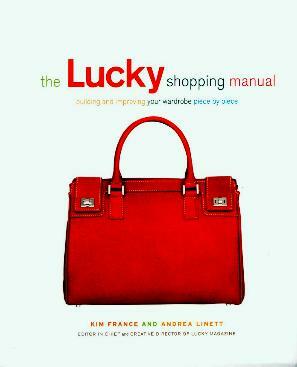 Kim France and Andrea Linett, from Lucky magazine, have constructed a superb fashion reference book - good solid advice on what goes with what in your wardrobe; the best bra for you; jeans - how to choose them and their uses; dresses; tops; swimwear; shoes; skirts, and so much more. Each section is beautifully illustrated with examples of different styles and with "fit and styling tips", building a closet (of each particular article of clothing), the best one for you, and "in the fitting room" hints. Assuming you know a little about what you can and can't (unflattering, etc.) wear, this gem of a book will help you take a new look at your existing clothes and help you decide on what and which clothes to spend money on. Seasons are also taken into consideration and the best thing is that the clothes featured can be considered classics and so will more than likely be available from year to year - slight modifications here and there are probably likely. You can always doll your clothes up with your own jewelry and accessories. I'm a skirts and tops or jeans and tops person so I need help looking even a tad sophisticated. There's nothing like having a constructive and useful closet of clothes - a stylish impression is better than just looking nice. Covers a wide age group. Conclusion - This is one of those books you'll refer to for years to come.